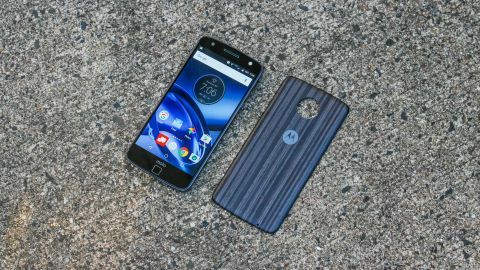 Update: The Moto Z has been succeeded, at least for now, by the new Moto Z2 Force, a shatterproof sequel that's nearly just as thin, but way more capable than the original Z. But if you care about software more than hardware changes, stay tuned for Z's impending upgrade to Android Oreo, which Moto has promised is coming in autumn. The original review follows below. The Moto Z is an Android phone with a new name that begins at the end of the alphabet, but is actually the first to pioneer modular connectivity in a more robust way than its competitors. It's the world's thinnest phone at 5.19mm in so-called "thickness," and it feels incredibly thin to hold. This isn't another meaningless marketing stat. Yet you shouldn't want it to stay this slim. There are already five practical, modular accessories – more than we have seen with the add-on-deprived LG G5 – and they satisfyingly and securely attach to the back of this phone with magnets. Moto Z's "build out your smartphone" concept is fun and, importantly, its MotoMods are creative and well-designed. There's everything from a predictable (but essential) battery back, to a more wild pico projector. Shining your phone onto a wall is an awesome novelty and it's completely hot swappable. No need to turn off the phone here. All accessories also work with the thicker, shatterproof Moto Z Force and the battery-rich and cheaper Moto Z Play variants, too. Motorola didn't dial back the performance of the Moto Z to set new thinness records or to make way for these magnetized accessories. Its specs are the same as its top competitors, including the ZTE Axon 7, HTC 10, LG G5, and Samsung Galaxy S7 and S7 Edge in the US. It has the same processor, RAM and internal storage and even a microSD card slot (no modding needed). The 13MP camera on back and real-flash-included 5MP camera in front are solid, though you can't miss that extreme camera bump in back. Somehow, even with that bump, it's still not the best in the world, just really good for everything but low light. Two things will throw people about the Moto Z: its lack of a headphone jack in favor of audio through the USB Type-C port and its un-Moto-like price. Its USB-C means of piping audio to earbuds means that the phone comes with an easily losable 3.5mm adapter, and you won't be able to charge and play music through headphones at the same time. The Moto Z price costs more than Motorola's previous phones. Is it worth that price bump? There's a lot of potential behind this modular ecosystem, but is it enough to be a best phones contender? Let's see how it does. The Moto Z US release date was July 28, 2016, and back then it was a Verizon-exclusive. Good news: it's available worldwide as an unlocked phone, including on GSM carriers in the US. That means it now works with AT&T, T-Mobile and Cricket Wireless, too. The price is higher than Motorola's previous Moto X series. Moto Z costs $26 a month through Verizon's payment plan over two years, or $624 at full price through the carrier. The actual SIM-free versions costs $699 in the US via Motorola (but won't peg you with hidden activation fees). The Moto Z UK price is £499 in the UK, while it costs AU$999 in Australia through Moto Online or Harvey Norman. Even if it's higher than past Motorola phones, take heart in knowing that you're not paying as much as you would for the US-exclusive Moto Z Force, which costs $30 a month or $720 in full. Ouch. To make buying it easier, Verizon offers a trade-in deal: exchange your current smartphone for up to $300 toward the Verizon monthly payment plan of either phone. For the Moto Z, that would mean escaping 11-and-a-half-months of device payments. And if you really can't afford to buy the regular Moto Z, you can always opt to the Moto Z Play. It's thicker and slightly less powerful, but has a bigger battery and works with all of the Moto Z mods just the same. Moto Z is a smartphone that takes thinness to a new level with a flagship-worthy stainless steel frame that measures 153.3 x 75.3 x 5.19mm. It weighs just 139g and feels astonishingly wafer-thin in one hand. It's the world's thinnest phone at 5.19mm in so-called thickness. What's uncanny about its dimensions is that Motorola introduced its thickness as 5.2 inches at Lenovo Tech World unveiling in June. When has a company ever rounded up on their smartphone thickness? This may be why Motorola didn't call it the Moto X 2016, even though that's really what this is. The design drops the curved back and familiar Motorola dimple for a flat and boxy shape that still feels good to hold. All of this means that it's so thin it doesn't even include a normal 3.5mm headphone jack. Yes, Motorola beat Apple's iPhone 7 and iPhone 7 Plus to dropping the headphone jack in favor of charging-audio output "solution." There's nothing on the bottom except for a USB Type-C port. Included in the box is a 3.5mm jack to USB-C cable to convert your existing headphones, or you have the option of using Bluetooth. This seems like the future, like or not, and Motorola is going first. The new connection that's more revolutionary – and favorable for consumers – is the Pogo-style pins on the back of the Moto Z that enable modular accessories. These 16 gold-plated connectors feed data back and forth between the phone and MotoMods. The entire back of the phone and all of the mods are magnetized so that the two parts click into place and, thankfully, no amount of shaking knocks them loose. You won't find a fingerprint sensor in the back since that's where the MotoMods connect. Instead, there's a tiny fingerprint sensor on the front of the phone at the bottom. It's right near the new "moto" lowercase logo (because that's how everyone in Silicon Valley does it these days). This non-clickable fingerprint sensor (which is totally not a home button, despite what your brain will say for the first week of ownership) is fast and accurate. The real home button is above it on-screen. That's fine, but the sensor and logo take up a whole bunch of otherwise dead space on the phone face. The sensor does have one standout feature: it not only wakes the phone with a finger press, but it also puts the device back to sleep. No more reaching for that tiny sleep wake button on the side. Why are the buttons equidistant? This is a relief because the Moto Z has very small power and volume buttons on its ultra-thin steel frame. These three side buttons are also evenly spaced and confusing to press at times. The fact that the power button is lightly riveted doesn't help this time around. Three equidistant buttons on the same side has caused us to press the power button when trying to turn the volume down (and, great, our phone is now off) and crank up the volume when we want to lock the phone (great, now it's insanely loud instead of locked and silent). The fingerprint sensor pulls double duty as a sleep wake button and is much appreciated. Fingerprints are more of a problem everywhere else on the Moto Z. This phone is a fingerprint and grease magnet – maybe to a world-record level, too. Both the front glass and the stainless steel back have been perpetually covered in smudges since day one. It's not very appealing or easy to wipe clean. Both the black and gold Moto Z color options we tested were loaded with them. All the more reason to add modular accessories to this Android phone. That can include "Style Shells" (aka its thin back covers that add a small curve) that come in a variety of textures (wood, leather and plastic). MotoMods are "world thinnest' title-destroying accessories, which sounds bad for the form slim factor, but this actually have us excited the about the Moto Z. They're more creative and plentiful than what we've found using the LG G5. The Moto Z Insta-Share projector is the most unconventional accessory: it's a pico projector that shines whatever's on your screen anywhere you'd like at a size of up to 70 inches before distortion kicks in. True to its name, it instantly worked the first time we tried it, and we've been able to watch YouTube videos and browse TechRadar in a passable 480p resolution without having to lug around a heavy projector. It's ideal for showing off funny videos to a group of people (those "Have you seen this video?" moments) without having to pass a phone or tablet around and laugh in strange intervals. The Insta-Share projector requires a dark or very dim room for its 50 lumens to be effective and, as you might have guessed, it doesn't come cheap: it costs US$299 (£249, AU$429). It worked to snipe far-away shots and we really liked the manual zoom and half-press shutter physical controls. Close-up pictures didn't look at natural vs the Moto Z camera, oddly enough, and there's a serious camera bump. You're going to have to really want distant pictures because it costs $299 (£199, AU$399). Motorola also partnered with JBL to pump up the volume with SoundBoost, which turns the back of the phone into a thick, powerful speaker. It's loud, but not nearly as loud as the best Bluetooth speakers we have tested, and it includes a handy kickstand that we really like. It's strong, and has a confident clicking sound to it. The SoundBoost also supplies 10 hours of battery life with its built-in 1,000mAh capacity for $79 (£69, AU$159). If that's not enough extra juice for you, there are several MotoMod packs that have 2,200mAh of additional battery life in exchange for a few millimeters of thickness added to the handset. The Moto Z can afford this supplemental girth. Battery mods cost $60 to $80 (£16 to £20, AU$119 to AU$139). The battery mod prices vary because they comes in four different designs, including from designers like Kate Spade and luggage maker Tumi. Case maker Incipio supplies the entry-priced versions. Moto is really trying to combine style and functionality with its battery packs, and it's way easier to clip on compared to a Mophie case. Be warned: unlike Mophie juice packs, these lack protection around the side of the phone. You don't have to buy a MotoMod right away to satisfyingly lock an accessory to the back of your new phone with magnetics. Moto Z comes with a Style Shield in the box. New ones within Motorola's Moto Maker store cost $19 to $24 (£16 to £20, AU$29 to AU$39). Further out, there's a lot of potential for MotoMods. Motorola is opening up its platform to one and all with a developer kit that costs USD$125 (about £94, AU$167). The possibilities for future MotoMods are exciting and, unlike Google's Project Ara modular phone, it's here now. At MWC 2017, new MotoMods were announced, from Amazon Alexa to a gamepad attachment that looks like the Nintendo Switch. We're waiting to test these out when they launch.